Nineteen years after the landing of the Mayflower at Plymouth, what is often considered the first 'constitution' of our country was drawn up by colonists from Hartford, Windsor, and Wethersfield, titled: 'The Fundamental Orders'. This document, which limited the power of government and gave men the right to vote, set forth and established a 'representative sytem' of government. Though colonists were under the rule of Great Britain, they sought to establish an ecclesiastical society which would be subject to their own rules and regulations. The January 14, 1639, orders were adopted and transcribed into the official colony records, becoming the 'constitution' for the colonial form of government (which, by the way is why Connecticut is called 'The Constitution State'). People wanted a democratic form of government ~ they wanted to escape tyranny ~ they wanted to live under their own rule. The colonists were unhappy with British rule and the unrest and discontent grew. There was also the issue of taxation. Though the colonists paid their taxes to Britain, they did not have any representation there and thus were unable to have a say in what took place. The "Taxation without Representation" issue, lead to King George sending extra troops to the colonies to keep under control any ideas of rebellion. Tensions grew, and while the King's troops were advancing on Concord Massachusetts in April of 1775, Paul Revere was to make his famous ride during which he gave warning to the people, "The British are coming, the British are coming!". The 'unofficial' beginning of the War for Independence began with the 'shot heard around the world' which was fired at the Battle of Concord. In June of 1776, a statesman from Virginia, Richard Henry Lee, proposed a motion of an 'independence resolution' to the Second Continental Congress which called for the colonies' total independence from Great Britain's rule. A committee was formed to draft the declaration, which became the 'Declaration of Independence'. Members of the committee included Thomas Jefferson, Benjamin Franklin, John Adams, Robert R. Livingston, and Roger Sherman. Chairman of the committee was Thomas Jefferson (later to be the third president of the United States). He wrote the first draft of the Declaration which was presented to the congress on June 28. On July 2, the Congress voted in closed session to declare independence from Great Britain, accepting Richard Henry Lee's 'independence resolution'. Franklin and Adams made minor changes to the first draft of the Declaration, presenting a final draft to Congress on July 4. A vote was taken from the representatives of the 13 British colonies ~ 9 voted in favor (New Hampshire, Massachusetts, Connecticut, Rhode Island, Maryland, New Jersey, Virginia, North Carolina, and Georgia), 2 voted no (Pennsylvania and South Carolina), 1 was undecided (Delaware), and1 abstained (New York). On July 4, 1776, the British colonies approved and adopted the wording of the Declaration which declared their independence from Great Britain, rejected any allegiance to the British monarchy, and claimed a new and sovereign nation ~ the United States of America. The President of the Continental Congress, John Hancock, then signed the Declaration, making it an official document. July 4, 1776 ~ INDEPENDENCE DAY!!!! The very next day, copies of the Declaration were distributed to the people; it was printed in the Pennsylvania Evening Post on July 6; and was read in public on July 8 in Philadelphia's Independence Square. 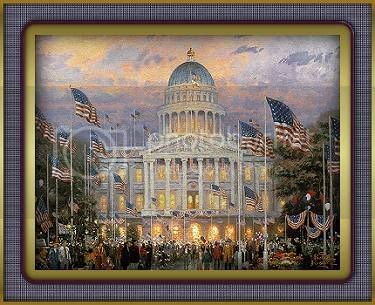 The first celebration of Independence Day took place on July 4, 1777, and has since been celebrated annually throughout the United States to commemorate the signing of our 'Declaration of Independence' which took place in Philadelphia, Pennsylvania, on July 4, 1776!!! In 1941, Congress declared July 4 as a federal legal holiday. The government of the United States recognizes eleven public holidays which are titled "Federal Holidays. These Federal Hilidays have been designated by our Congress in the United States Code Title 5 Part III Subpart E Chapter 61 Subchapter 1 § 6103 HOLIDAYS. As Congress only has the authority to establish 'holidays' for federal institutions, federal employees, and the District of Columbia, there are no 'National Holidays" in our country. By Constitution, the federal government can not force States, local governments, or employers to observe Federal Holidays. Most States, however, do recognize and observe the Federal Holidays. On occasion, Presidents of the United States have declared a public holiday through Presidental Proclamation. Though Federal law allows for this, these public holidays do not become "Federal Holidays", but rather 'national observances'. When Did Your State Join The United States Union? Born Again American is committed to the rebirth and re-expression of citizenship through informed and thoughtful activism. It is an initiative of Declare Yourself, a national non-partisan, non-profit (501(c)3) organization dedicated to increasing young voter participation and civic involvement. Declare Yourself’s on-line voter registration tool has been used by almost four million people since 2004. Declare Yourself grew out of the 2003’s Declaration of Independence Road Trip that toured an original 1776 copy of the Declaration to schools, town halls, and other locations all over the country. The founder, TV producer and philanthropist Norman Lear, was talking with Academy Award-winning songwriter Keith Carradine one night, and the Born Again American video was, well, born. It took the efforts of Director Mark Johnson of Playing for Change, Producer Brent Miller, and 16 performers and two choruses to bring Keith’s song to life in 14 iconic locations around the USA. The singers and musicians, non-professionals all, were chosen because they are living the lyrics in these troubled times, not just performing them.